Pay TV, which refers to subscription-based television services, is part of the dynamic and profitable TV industry in the United States. Despite the rise of cord-cutting and increasing consumption of streaming services, global television subscription revenue is forecast to continuously grow in the next few years, with the pay TV penetration rate projected to reach 96 percent in the U.S. by 2018. The Asia-Pacific market is unsurprisingly the largest in the pay TV industry, and unlike the North American market, is projected to continue growing in the coming years. The majority of the revenue generated by providers of cable and TV subscriptions in the U.S. comes from advertising and program revenue (licensing of rights to broadcast specialty programs), with air time – which includes advertising and program content – also contributing about 36 percent of the total revenue. In line with the overall declining trend, the number of pay TV households in the U.S. is expected to slightly drop in the coming years, going from 99.4 million household in 2016 to an estimated 95 million by 2020. Much of this decline can be attributed to cord-cutting, that is, a pattern of viewers cancelling their pay TV subscriptions. Many household justify the cancelation of a pay TV subscription on money issues; over 46 percent of Americans plan to cut their subscriptions if prices continue to increase. About 40 percent of the survey respondents also stated that online paid services are cheaper than cable; therefore, they decide to cancel their subscriptions. Streaming services rise as a more affordable alternative, considering about half of North American consumers paid between six and 11 U.S. dollars monthly for their subscription to services such Netflix or Hulu. These services also have a direct impact in cord-cutting, as households with streaming services are more likely to have no cable or satellite TV than the households without these subscriptions. Comcast Corporation is the leading pay TV provider in the U.S. in regards to subscriptions, and holds about 24 percent of the pay TV market share in the U.S. DirecTV is the second largest pay TV provider, with an estimate of 20.3 percent of the market share, followed by Dish Network. 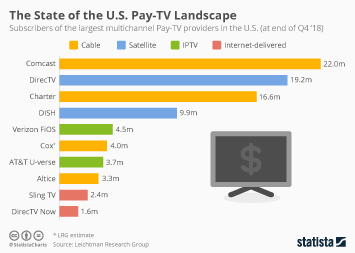 The market share of pay TV providers is forecast to remain similar in the coming years, with variation of one to two percent between 2014 and 2021.